A couple days ago, I went with my friend Vinod to see a screening of a film called August: Osage County that is coming out in a few weeks. It’s an adaptation of Tracy Letts’ Tony winning play starring a who’s who of great actors including Meryl Streep, Julia Roberts, Margo Martindale, Sam Shepard, Ewan McGregor, Julianne Nicholson, Juliette Lewis, Chris Cooper, and more. There are a lot of heart-wrenching performances, but the one thing that stuck with me the most, the one thing I’ve continued to ponder since seeing the movie is the performance, or presence of the state where the movie is set and filmed, Oklahoma. There is a pervasive heat that you feel the entire time you are watching the movie. That sticky, sweaty, cloying heat is alluded to even in the title of movie. If you’ve ever spent an August in Osage County or near Osage County, you know what I’m talking about. The movie was filmed about an hour away from the town in Kansas where I grew up. In fact, because of my Dad’s illness, I was in Kansas last summer, when they were filming the movie, and it was a particularly hot summer, some of you might even remember. So, while Meryl and Julia and Margo and Julianne and Juliette were proximating a dysfunctional family dealing with a family crisis in the part of the world I know best, I was with my (probably slightly more functional) family dealing with a family crisis of our own. I wept every time the state of Oklahoma flashed on the screen. 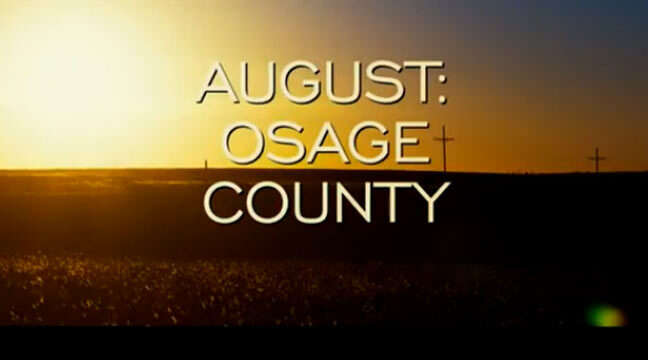 Several scenes take place when people are driving down the road or driving through a small Oklahoma town. Certainly, there was recognition for me when I saw those old-fashioned churches, or once grand country homes that had fallen into disrepair or that sky, wide open, both in day and night. But it was more than recognition, it was wist. And it was love. I was born in Bartlesville, Oklahoma and raised most of my life, just 45 minutes away from there in Independence, Kansas. I’m proprietary about that part of the world, because it’s still mine. And watching this film, moments of which were masterpieces, I understood why people stay and why people leave and why they come home again, and also, why, even if you never come back to live, the plains will always be a part of you. Eboni, 2 words: Road Trip. I love this entry, Ray!!! I was just back home last week and noticed for the first time how beautiful & peaceful it is, especially when we came back and hit good ol’ SoCal traffic around Riverside. I didn’t remember Big Hill Lake being so big and blue. Dad just remarked how things get taken for granted growing up there. Your Dad is right, we did take things for granted. That being said, I’m awful fond of the home that I was born into and the home I’ve adopted. We’re lucky folks, Mona!! Cliff, I’m glad you posted a link to your Kansas blog posts. I remember vividly reading Kansas Prayers when you wrote it. I, too, feel that spiritual and physical connection to our home state.